James Matthew Barrie was born on 9th May 1860, in Kirriemuir, Angus, Scotland. J. M. Barrie was the ninth of ten children (two of whom died before his birth), born to Calvinist parents, David Barrie and Margaret Ogilvy. Barrie was sent to Glasgow Academy at the age of eight, where he was looked after by two of his older siblings, Alexander and Mary, who taught there. He went on to study at the Forfar Academy, and then at Dumfries Academy. He became an avid reader of penny dreadfuls and works by authors such as Robert Michael Ballantyne and James Fenimore Cooper. This love of fiction led Barrie (along with his friends at Dumfries), to form a drama club in which he produced his first play, Bandelero the Bandit. Barrie’s desire to follow a dramatic career was not approved of by his parents, who wished him to go into a profession such as the ministry. However, they arrived at a compromise when he agreed to attend University, but would study literature. He received his M.A. From Edinburgh University in 1882. After a brief spell as a staff journalist at the Nottingham Journal, J. M. Barrie returned to Kirriemuir and began writing stories based on the tales that his mother had told him about the town. He submitted these to the newspaper St. James’s Gazette in London, who liked his work. Barrie consequently ended up writing a series, which served as the basis for his first novels: Auld Licht Idylls (1888), A Window in Thrums (1890), and The Little Minister (1891). Alongside his novels, J. M. Barrie began to produce many works for the theatre. His first venture into the medium was a biography of Richard Savage which he co-wrote with H. B. Marriott. This was only performed once and was critically panned. However, his next theatrical work Ibsen’s Ghost (or Toole Up-to-Date) (1891), a parody of Henrik Ibsen’s dramas Hedda Gabler and Ghosts, was much more favourably received. 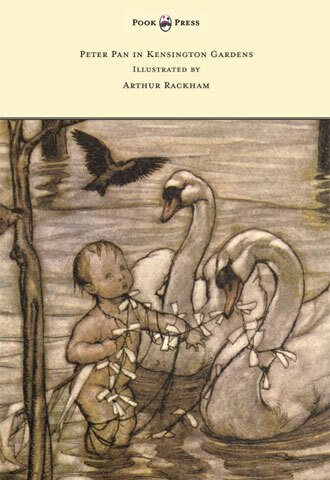 The Little White Bird – Illustrated by Arthur Rackham, 1902. 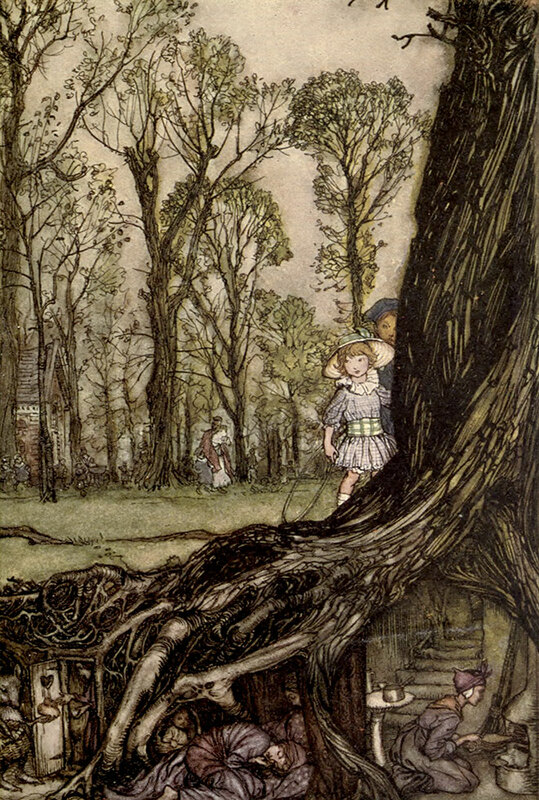 Arthur Rackham, Peter Pan in Kensington Gardens, 1918. It was during his third play that J. M. Barrie met his future wife, the young actress, Mary Ansell. The pair were married on 9th July 1894. Unfortunately, Mary had an affair which Barrie learned of in 1909, and the couple later divorced. They had no children together. 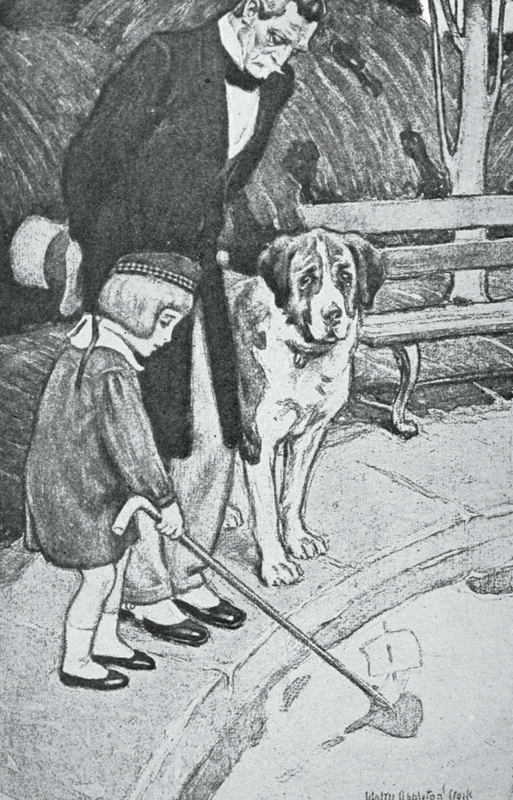 J. M. Barrie was very well connected in literary circles. One testament to this was his role in founding an amateur cricket team that included members such as: Rudyard Kipling, Arthur Conan Doyle, P. G. Wodehouse, Jerome K. Jerome, and G. K. Chesterton. 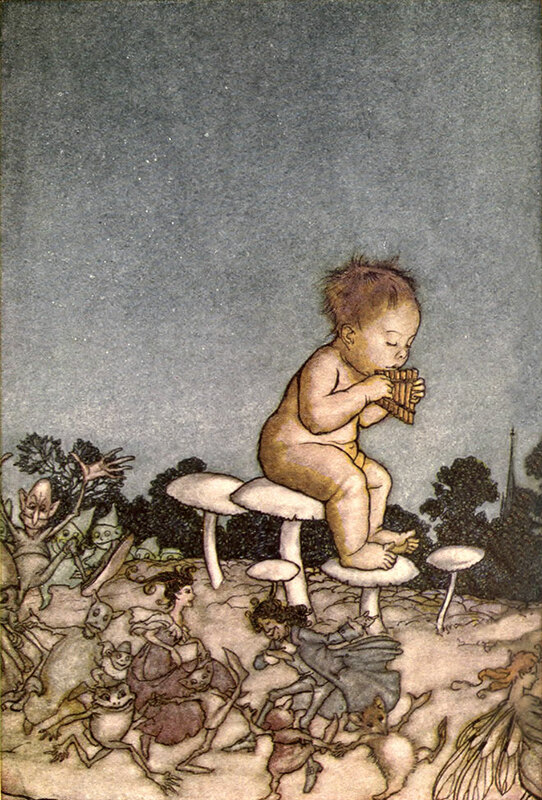 J. M. Barrie’s lasting legacy to the world was his creation of Peter Pan. 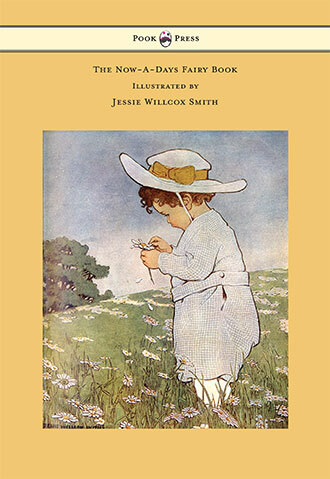 This character first appeared in The White Little Bird, serialised in the United States, and then published in a single volume in the UK in 1902. The work that catapulted his character to become a household name was Peter Pan, or The Boy Who Wouldn’t Grow Up. This was first performed as a play on 27th December 1904, but in 1911 Barrie adapted it into the novel Peter and Wendy. 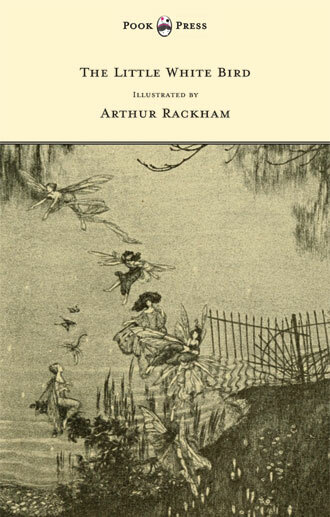 It has since been illustrated by such greats of the Golden Age of Illustration as Arthur Rackham, and Mabel Lucie Attwell. Despite its popularity in the present day, the name Wendy was not in common use at the time, but Barrie’s work popularised it. The name was actually inspired by the daughter of friend and poet William Ernest Henley (1849 – 1903; best remembered for his 1875 poem “Invictus”),who called Barrie ‘Friendy’, but could not pronounce her Rs very well and so it came out as ‘Fwendy’. Upon his death, J. M. Barrie left the copyright for Peter Pan to Great Ormond Street Hospital in London. He died on 19th June 1937, of pneumonia. Barrie is buried next to his parents and two of his siblings, at Kirriemuir, Angus, Scotland.